I love Signatory’s ‘Vintage Cask Strength Collection’ and I collect Highland Park so I pounced on this bottling when it first appeared. Much to my surprise it took a few months to sell out. £90 might seem a lot for a 15-year-old until you consider that a) Highland Park is very collectable b) it’s cask strength and c) the standard 15-year-old direct from the distillery is £65 (and only 40%). Nose: Apple, a bit alcoholic at first but it goes away with aeration. Oily, mineral, a bit smoky. Taste: Punchy, peppery, apple & lemon, some salt. Good. With water : it’s more tamed, mineral and lemony. Better. Finish: Long, a bit grassy (without water). With water, lemony. 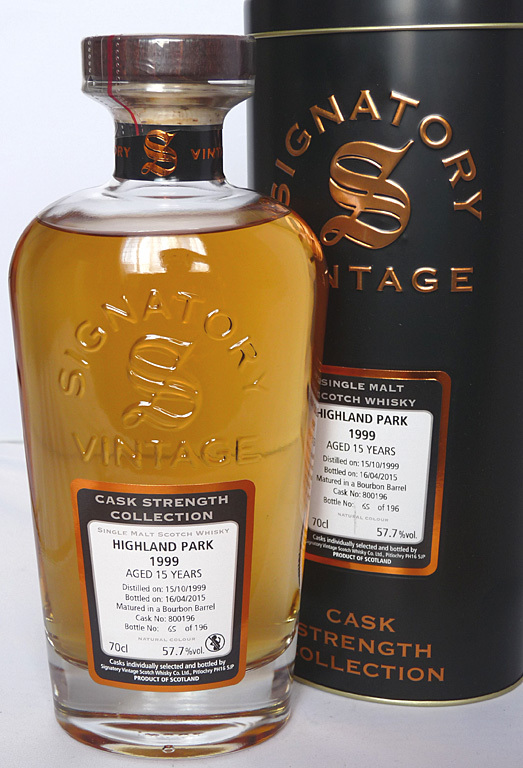 This entry was posted in Highland Park and tagged 15yo, 1999, 57.7%, 70cl, Cask Strength, Cask Strength Collection, Highland Park, Islands, Master of Malt, Orkney, Signatory, Single Malt. Bookmark the permalink.